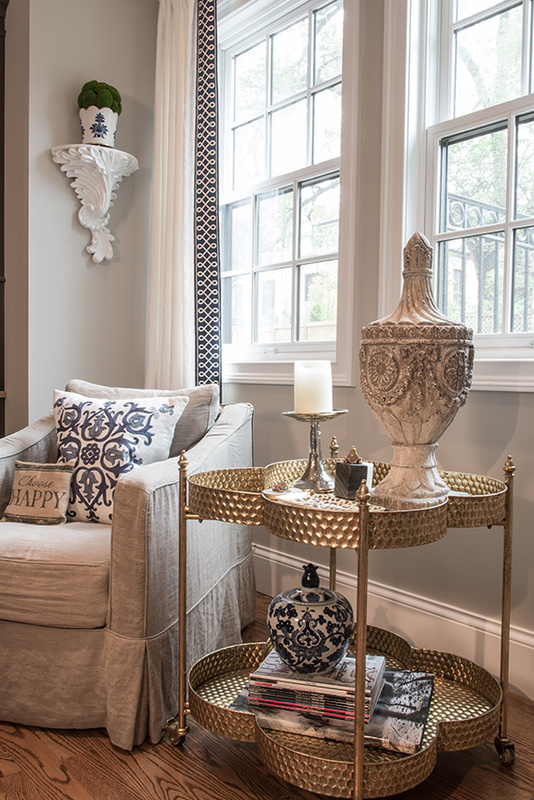 Inspired by the city skyline, a homeowner adds a modern, glam flair to her newly built home. The walls of the entry are enhanced with the addition of a subtle faux, gray-lizard-skin-patterned wallpaper and a silver leaf wallcovering on the ceiling. Riley always wanted a round dining table, so this glass-topped table with an antique mirror bottom is the perfect fit. 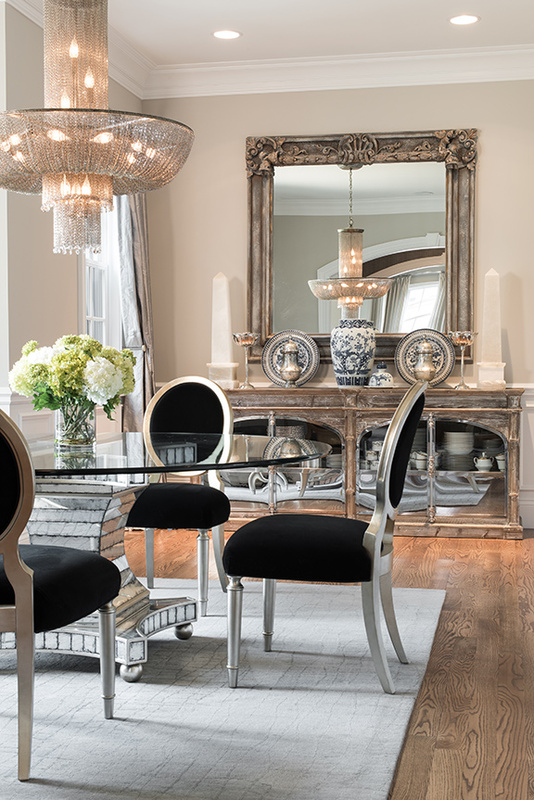 The homeowner loves to mix metals in a room, so the champagne-framed dining chairs mix well with the dramatic chain chandelier. 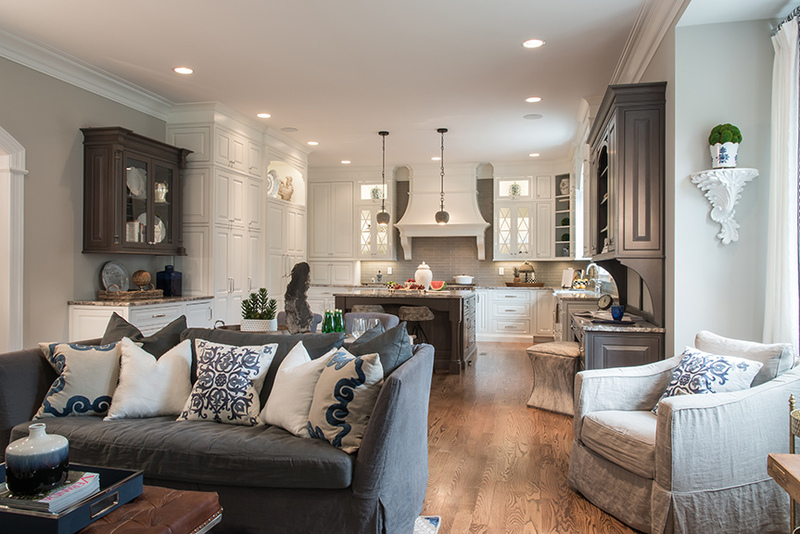 The homeowner wanted the living room to have a more-formal look yet still remain comfortable. She always tries to hide the TV when possible, and the mirrored-cabinet is an elegant and stylish was to conceal the electronics. 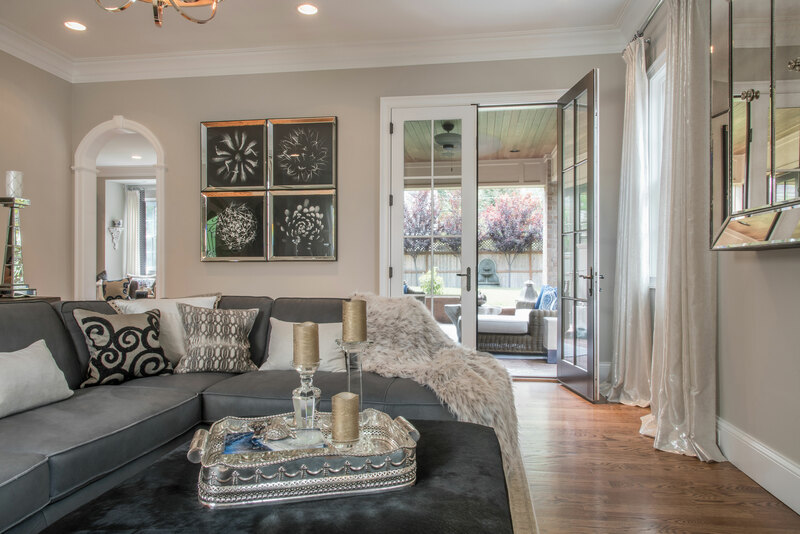 Modern glitzy touches in the living room include the mirrored black-and-white prints and sumptuous faux-fur throw. A console table and mirror from Wilson Lighting mix woods with the mirrored texture for a casual yet chic feel. 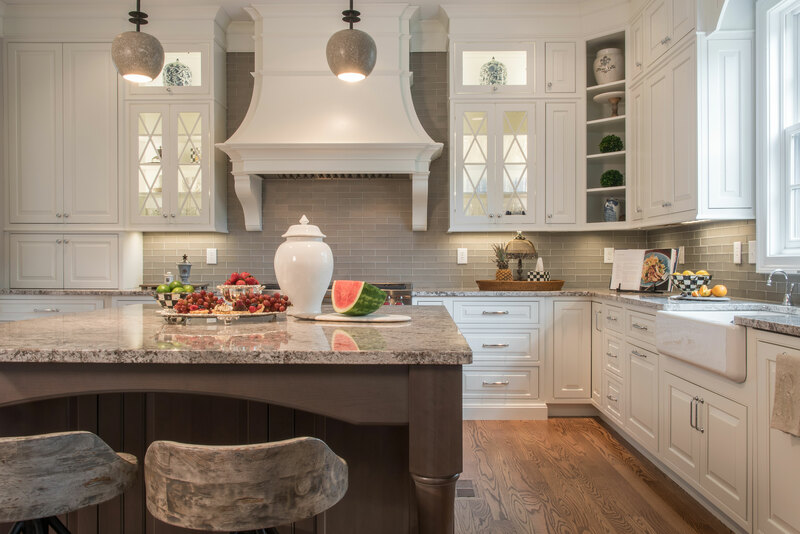 The homeowner loves the two-tone cabinetry and gray tones in the kitchen. Purchased from Rusted Chandelier, the gold bar cart showcases a variety of accessories. The blue-and-white scheme is continued in the drapery, pillows and vase. In the open kitchen/hearth space, Riley mixed aspects of the more formal living and dining rooms but with a more casual feel. 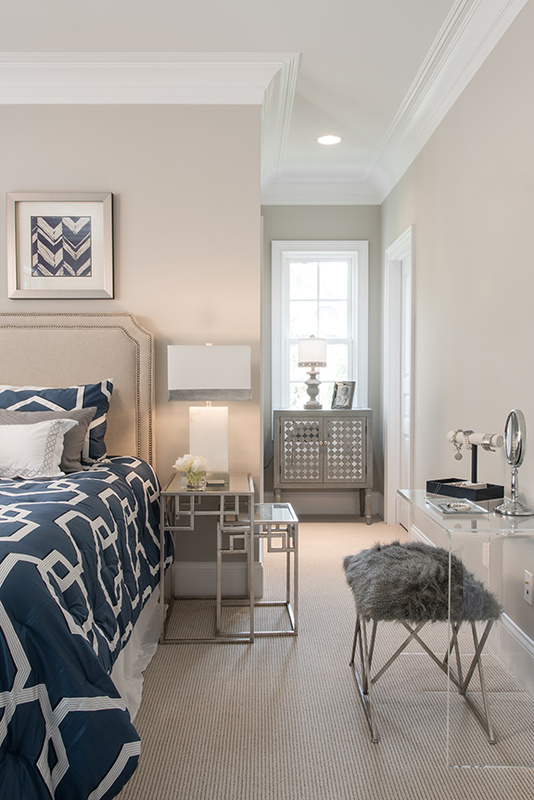 The blue-and-white theme is continued in the guest bedroom, which is finished off with chrome details. The treatment by Claude Breckwoldt imitates detailed molding on the cove ceiling. Riley purchased the antique replica altar table from Louisiana. Riley grew up in the Clayton/U City area and her parents owned a dance studio in Clayton, so for her this home purchase feels like she is coming back home. But finding her home wasn’t exactly a walk in Shaw Park. On a Monday she just started driving around the area looking for new-construction homes. “I think it was the only new one left in Clayton,” she explains. “And I liked the looks of it. I could tell it was well built.” Riley toured the home on Tuesday and by Wednesday put in a contract. Beyond its prime location, she loved how much beautiful light splashed throughout the home as well as the archways. Tom Zupon of Zupon Construction was about 95 percent done with the building process when Riley put in her contract. He purchased the 60-year-old home that previously occupied the lot and tore it down. Not just a builder, Zupon also holds a real estate license through RedKey Realty, which helped facilitate the sale of the property. Working within the constraints of Clayton codes, Zupon designed a home with expansive amounts of limestone on the exterior and a raised balcony on the second story. Also unique to the property, a four-car underground garage is tucked under the back yard. Eighty percent of the space above the garage is grass and yard, making for a nice sized outdoor space for a Clayton home. On the interior, Zupon wanted to keep the home really open. “A signature of my houses is the detailed trim work,” he says. 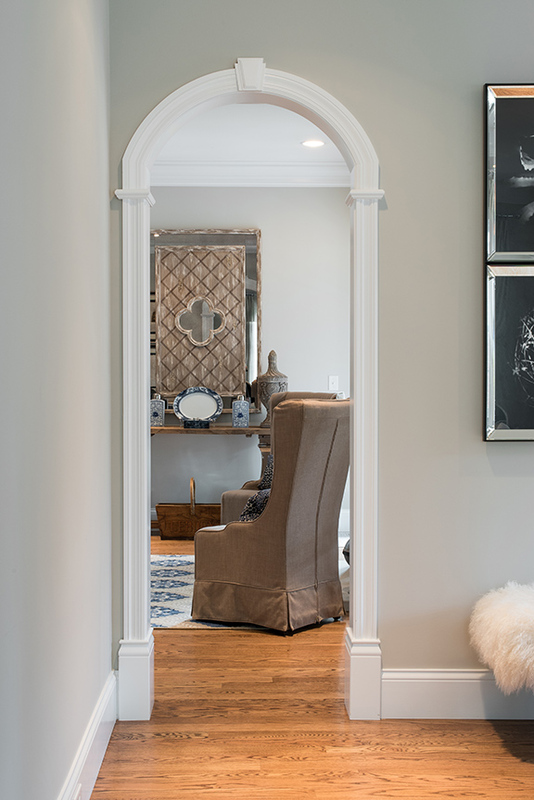 “Lots of rounded entryways into every room with beautiful trim around each.” He also pushes for higher ceilings whenever possible with this residence boasting 10-foot ceilings on the main and lower levels and 9-foot on the second story. 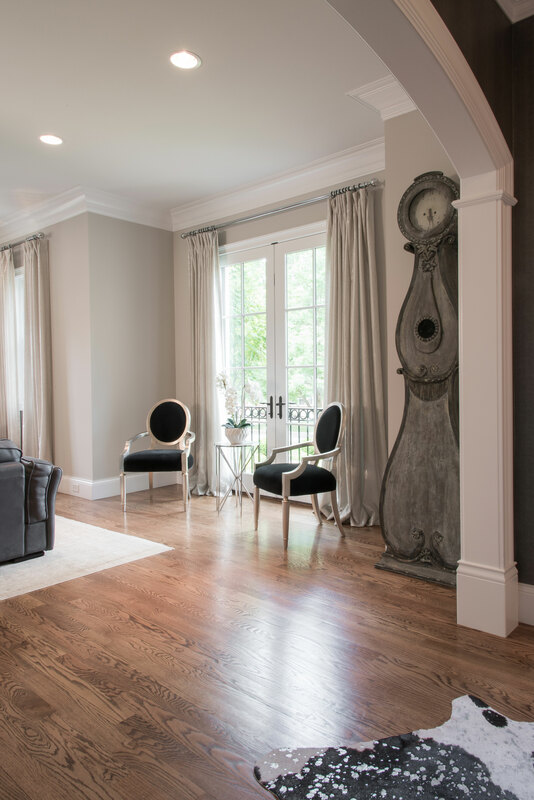 With all finishes already selected like the gray walls, dark wood, light cabinets and glass tile, Riley only had to focus on the furnishings and accessories to make this house her home. “What Claudia did with the home is incredible,” Zupon says. 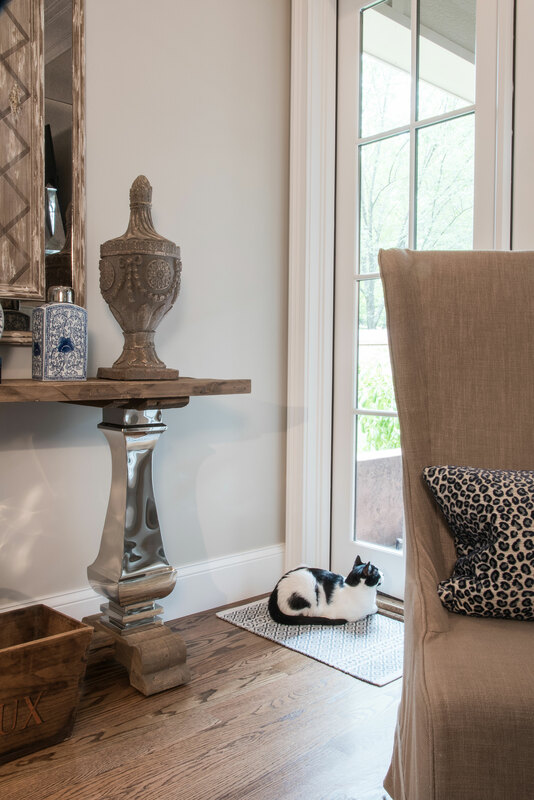 Riley prides herself in the search for the right furnishings and accessories. “I obsess and scour places until I find what I like,” she explains. Some of her favorite shops to visit include Wilson Lighting, Rusted Chandelier, Ken Miesner’s Flowers and Warson Woods Antique Gallery. Her former residence had more of an Old World/French country feel. She went for a complete style swap in the Clayton home with a more modern approach and touches of glitz with a few rustic pieces thrown in. The entry foyer is a perfect example of Hanish’s detailed designs. Wanting the entrance to have an impact, she elevated the gray walls by adding a subtle faux gray-lizard-skin-patterned wallpaper to the walls and a silver leaf wallcovering on the ceiling to give both surfaces texture and interest. Then, in the actual foyer, which connects the living and dining rooms, she commissioned an artist to paint the ceiling in a shade of gray with a circle of silver-leaf paint. A beautiful black-and-white cowhide rug has touches of silver leaf throughout to tie everything together. Having only brought a few special furnishings from her previous home, Riley basically started from scratch when it came to furniture and accessories. She started first in the living room and hearth room before moving upstairs to the bedrooms. It is important to her that the more formal spaces like the dining room and living room have a more elegant look. While more formal that the hearth, Riley still wanted the living room to have a comfortable feel where she, her children and guests could come in and put their feet up. The furnishings and décor in the space are contemporary with touches of pizazz, like the mirrored black-and-white prints, hide-on-hair ottoman and zebra-print rocker. “I’m a sucker for hides and fur,” Riley says with a laugh. She layers the elements over more traditional fabrics and leather to add an extra element of texture. In the dining room, Riley knew she wanted a round, glass-top table with an antique mirror bottom. “We spent a lot of time making this space just right,” Riley says. 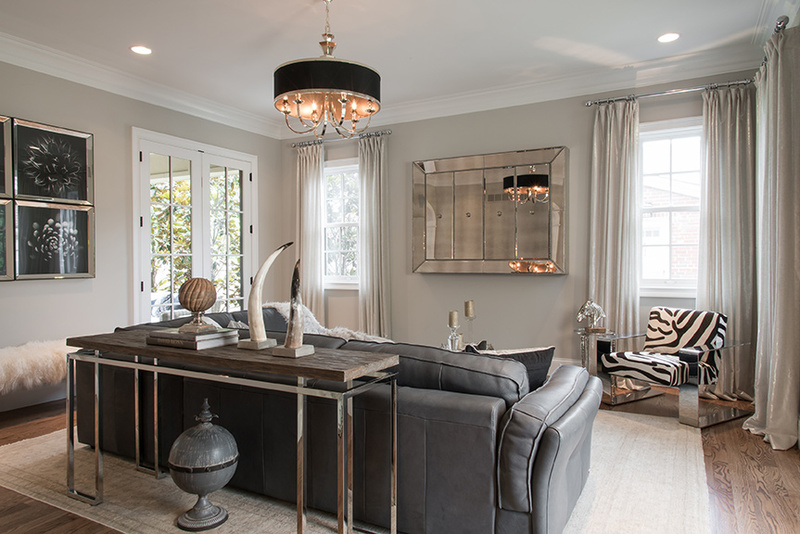 The designer and homeowner finally decided on a glass table with mirrored pedestal purchased from KDR Designer Showrooms. Chairs with a champagne frame and black velvet seat from Wilson Lighting were the perfect complement to the table, plus Riley loves to mix metals in a space. Since the dining room is located in the front of the house, Riley and Hanish needed to come up with a solution for window treatments that would allow natural light but still give some privacy to the room. Riley relied on Hanish, who dreamed up a creative solution that is so glamorous. She took two different Kravet Couture fabrics, a gray silk with reflective Swaroski crystals and a hand-woven gray silk satin macramé-styled weaving with sequin detail, and created a unique dual panel design. “It is so cool how the light is diffused through without blocking any of it out,” Riley says. The adjoining kitchen and hearth room complete the main living level. Riley made minimal changes as the kitchen cabinetry, tile and counters were already selected and installed upon purchasing the home. She did add additional cabinetry in the form of a desk and pantry space using the same Beck/Allen cabinetry as Zupon. An antique sofa table made by her great-grandfather and passed down through the generations serves as her kitchen table and divides the kitchen from the hearth room. “The hearth is a good mix of aspects of the more formal living and dining rooms with a more casual feel,” Riley explains. She chose a blue-and-white theme for its timeless look, which is found in the draperies, accent pillows and accessories. “I used blue in my previous home and loved it, but this time I went for a heavier, strong blue. Like a navy/cobalt,” Riley explains. The second level includes a guest bedroom, which continues the blue-and-white theme, a moroccan-inspired bedroom for her her college-aged daughter and the master suite, which Riley says is her sanctuary. 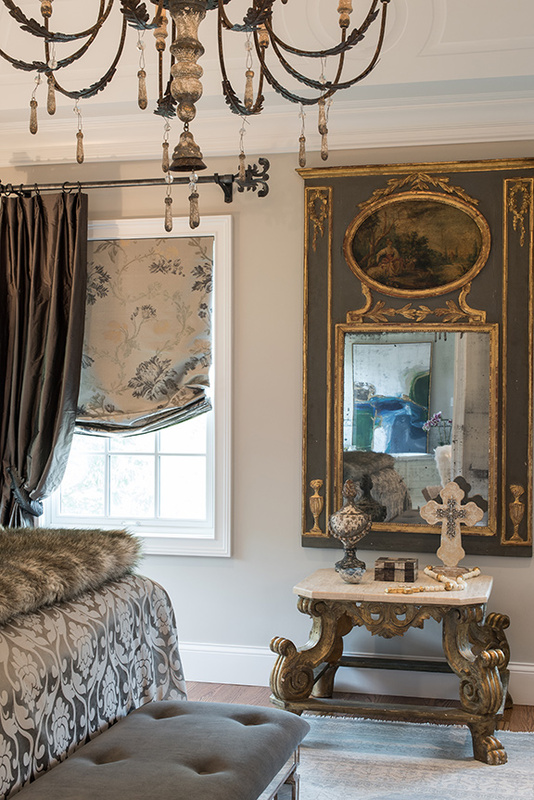 A little less cosmopolitan and a little more French-y, as she explains, the master suite features a mirrored bench, fur pillows and throw and an antique replica altar table by Tara Shaw from Louisiana. The piece de resistance in the bedroom is the exquisitely detailed ceiling. Hanish designed the trompe l’oeil to imitate detailed molding on the cove ceiling. 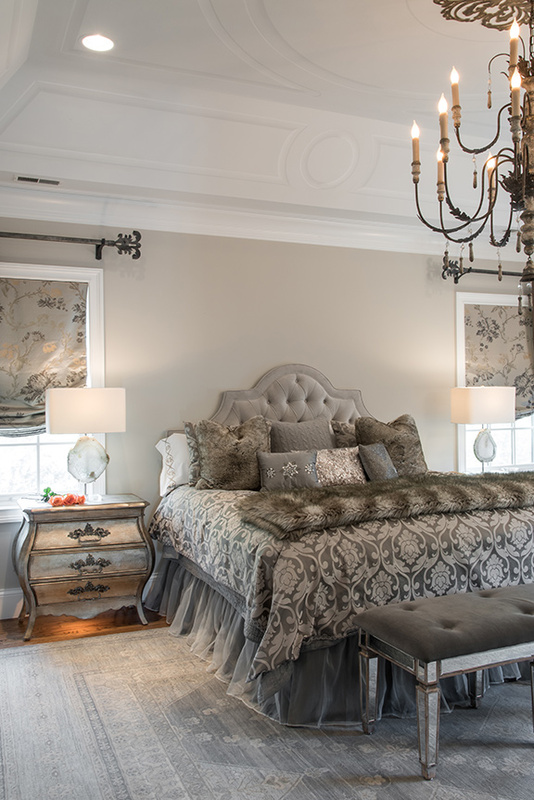 “The results are fabulous and elevate the room with all of its rich details in the silk drapery, detailed drapery hardware, French chandelier, taupe velvet headboard and sumptuous bedding,” Hanish says describing the room. With the help of Hanish and the experience under her belt from decorating her previous residence built just three years ago, Riley says the decorating process has been surprisingly easy despite totally changing her style.